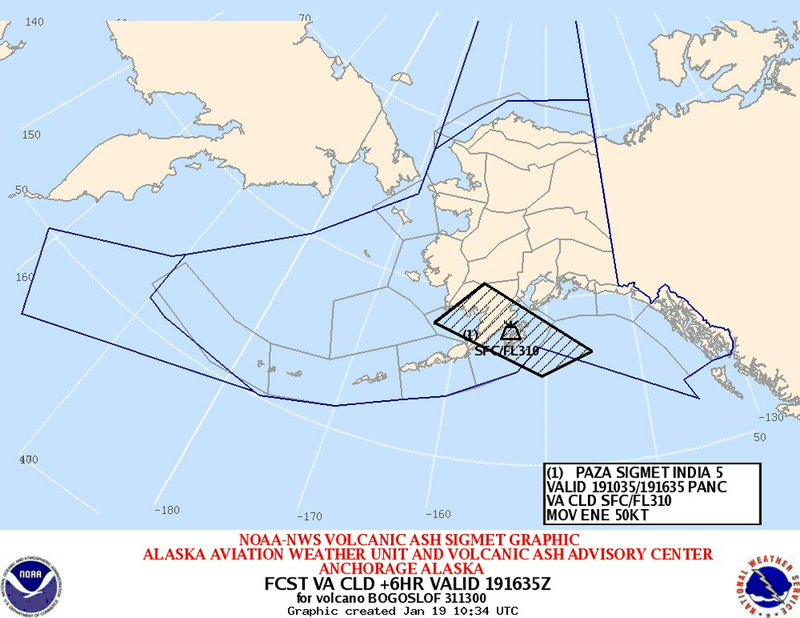 Another eruption of Bogoslof volcano in the Aleutian Islands sent an ash cloud east over the Alaska Peninsula and Kodiak Island on Wednesday, disrupting aviation in the region but producing no signs of ashfall on land. 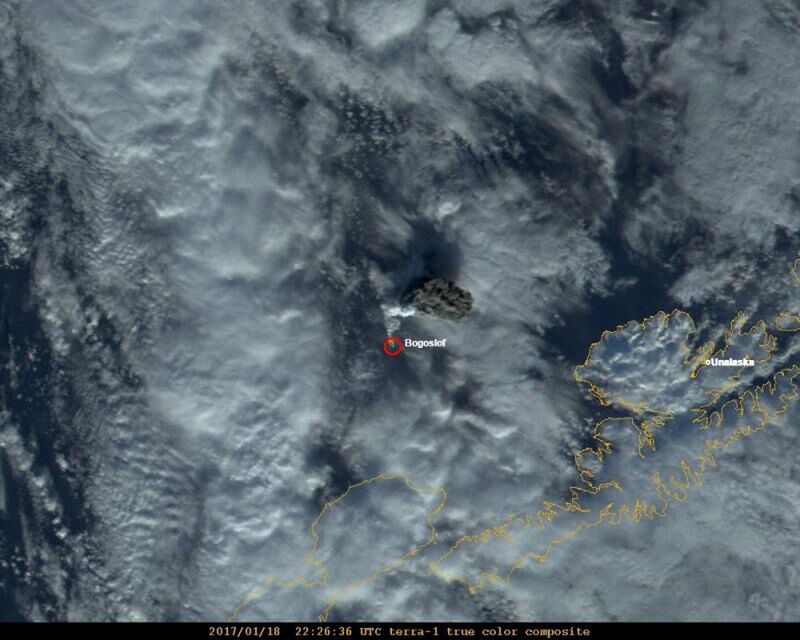 The Alaska Volcano Observatory said Bogoslof, on a tiny island about 60 miles west of Unalaska, erupted twice at about 1:20 p.m. and 2 p.m. Wednesday. The first, stronger eruption produced a high-level ash cloud. "Pilots reported the cloud reached a height greater than 31,000 ft (above sea level), and prevailing winds carried it northeast over the Bering Sea," AVO staff said. "This eruption also produced lightning strikes, and infrasound signals detected by sensors in Sand Point and Dillingham." A National Weather Service graphic shows the location of an ash cloud (in black) from an eruption of Bogoslof volcano in the Aleutians as of 1:34 a.m. Alaska time on Thursday, Jan. 19, 2017. Unalaska police and Kodiak fire dispatchers said they had no local reports of ashfall overnight Wednesday, and neither the observatory nor the National Weather Service had any reports of ash falling on land by Thursday afternoon. A satellite image taken after the first eruption showed an ash cloud just northeast of Bogoslof that AVO said was "darker in color, and presumably more ash-rich, than others we have seen in the eruptive sequence" that began in mid-December. "This image also suggests the presence of very hot material (lava) at the surface immediately surrounding the vent — the first such observation during this eruption sequence," AVO staff wrote. 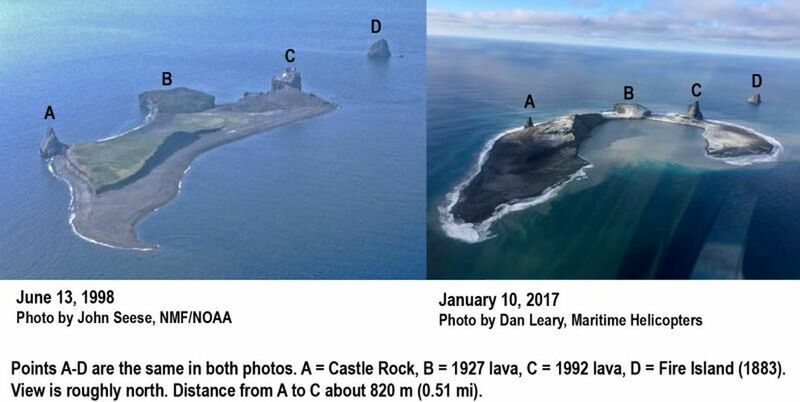 Chris Waythomas, a geologist at the observatory, said previous Bogoslof eruptions over the past month occurred underwater and sent up clouds of steam. A lot of the ash from those blasts was frozen into ice crystals and quickly became undetectable, but much more ash was visible in Wednesday's main eruption. "Soon afterward we could see elevated temperatures at Bogoslof in satellite data — for that to happen you have to have lava right at the surface," Waythomas said. "That was only in one image, and in subsequent images we didn't see the thermal signal." After the eruptions, the volcano's aviation color code had been raised to red and its alert level to warning — AVO's highest indicators of potential activity — but they were lowered to orange and watch on Thursday afternoon. Waythomas said seismic data from the volcano has been "pretty quiet" since the Wednesday eruptions. Waythomas said violent interactions between magma and seawater may have removed any materials, such as lava plugs formed during eruptions in 1883 and 1992, that broke the sea's surface during the blasts. "It's possible that a plug of lava is close or at the surface, but may have been destroyed by the effects of the eruption or collapsed into the vent," Waythomas said. "We're kind of expecting to see that, eventually: a vent of lava extruded." Robert Easton, an aviation forecaster with the National Weather Service's Alaska Aviation Weather Unit in Anchorage, said the unit issued an advisory to aviators tracking the cloud's location overnight Wednesday but canceled it Thursday morning because the ash was no longer appearing on radar. "It has been affecting flights all (Wednesday) night," Easton said. "At least three or four were affected at the minimum." Dave Barber, also at the weather unit, said forecasters were able to track pilots diverting around the ash cloud while the advisory was in effect. "We could see on plots of aircraft flight locations that they were avoiding the area, fortunately," Barber said. Tom Winn, with the operations staff at Ted Stevens Anchorage International Airport, said air traffic controllers didn't have any word of canceled flights due to the ash cloud. Pilots may have chosen to divert their flight paths, however. "There's been no impact at the airport as far as I'm aware of," Winn said. A temporary flight restriction from the Federal Aviation Administration remains in place over Bogoslof, Waythomas said.